First click Teams on the left side of the app, then click Join or create a team at the bottom of your teams list. Then click Create a new team at the top right of the app. 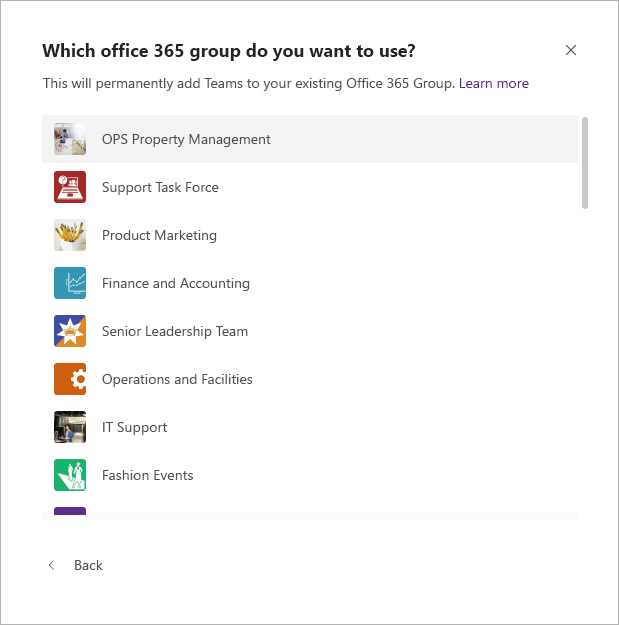 From here, select Create from…, and choose Office 365 group. You’ll be presented with a list of groups that you currently own, don't already have a team associated, and have less than 5000 members. Select your desired group, and a team with the same name will create automatically. The team will share the same group privacy (public or private) and members as the original group. This option is not available for groups that have more than 5000 members or have been previously added to another team. Groups created through Yammer cannot be converted to a team.